At Elite Training Systems we have created a unique approach to assisting athletes in attaining their fitness goals. We offer cyclists, triathletes, duathletes, and fitness enthusiasts of all abilities a challenging and fun training program performed on our 8 station connected system utilizing your own bike. Yes, all eight riders are wired together so that you know the exact distance, in feet, of the rider in front of you, and behind you catching you as well. Our computer delivers the course to your bike as you pedal and shift like you're on the streets, feeling the hills, and watching your progress and stats on a large movie screen. 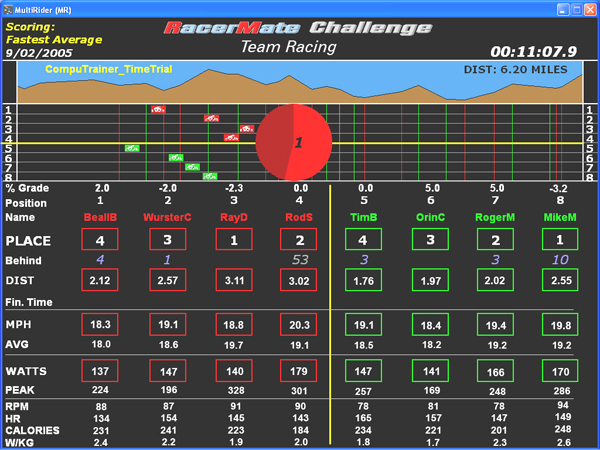 Your personal statistics are tracked throughout the course. This includes current and average watts, watts per kilogram of body weight, speed/mph, current and average rpm, distance, heart rate, time and place within the group. We can also set up drafting, a feature where resistance let's up when you are within 8 feet of a rider, which everyone loves (when they're in it). Left picture below shows a group in progress. The group atmosphere offers energy, excitement and an element of competitiveness that helps you to train beyond your best. You will not experience this type of quality workout outdoors, at a spin class, or on your own. We currently offer two ability groups, level 1 and level 2. By closely matching participant abilities within the group we create a close competition every week. We also offer specialty workouts for pre-riding actual race courses like the Mt Diablo Challenge, Wildflower, or the Bears loop, as well as repeated time trial events to showcase your talents and chart your improvements. 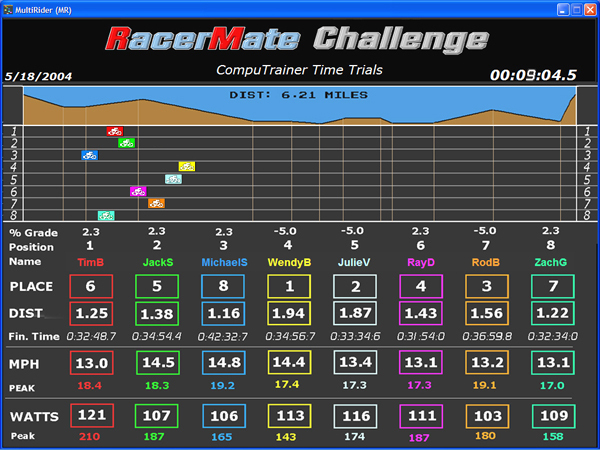 Improvements are shown in only a few sessions. We can also build a specific course just for you, maybe an upcoming event, for early practice. Or, bring your friends, set up teams, (e.g. two groups of four) and race each other (right picture below). This is also fun cross training for runners. Watt-based zone training is also available. Begin with a functional threshold power test to determine your current fitness level. Training intensities will be developed using both heart rate and power (watts) zones. Then have a periodized training plan (build-ups and recovery weeks) designed around your event dates. "The ability to track my performance with so many different and important pieces of information and adapt my movement to perform at optimum level. If I lose my proper form for a moment, watts go down immediately. If I am not applying steady circular motion to the pedals, MPH goes down and I adjust. It has trained me to constantly be aware of my movements during the ride!" "The "push" to train at a level higher than I ever would if I were by myself. Seeing the statistics as well as the information on the other riders in my group forces me to work harder and explore and expand my limits. Even on the "flat or downhill" profiles, maintaining watts and MPH is challenging." "I like the energy of the riders around me experiencing the same challenge." "Great intensity sessions for the time crunched athlete-worker-parent." "You train like the pro's, on your own bike, in a safe environment." "I like the statistics in real time: watts, speed, distance, mph, and watts per kilogram body weight." "You can't cheat. It's continuous exertion, pushing watts, whether it's up or down hill." How to Register by check for courses through In-Training. New to our unique cycling training? Try out a "Free Ride"
*Let us know when you like to train. We will put a group together at your preferred day and time. 3-8 people per group. At Elite Training Systems we utilized a science based approach to assist athletes in attaining their fitness goals. We offer athletes of all ability levels an 8 week, custom, power based training program performed on our Multi-Rider Computrainer System utilizing your own bike. We begin your Elite Cycling program by customizing your training intensities based on results from your initial physiology lab evaluation, which also indicates your baseline fitness. At the end of each 8 week cycle you are retested in the lab to verify fitness gains and determine new training intensity zones. Elite Cycling offers athletes the most efficient means of gaining fitness by ensuring that you are working at the correct intensity all the time and the group atmosphere offers energy and excitement that pushes you to the next level. 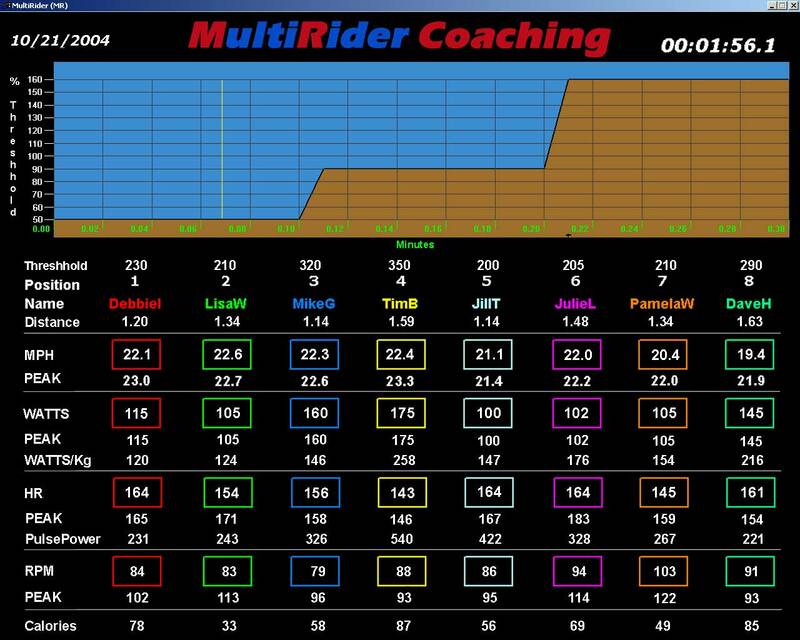 During each class your performance statistics, along with those of the 7 other riders you are training alongside, are displayed on a large movie screen indicating watts, heart rate, cadence, speed and distance. ETS also offers classes for pre-riding actual race courses (pictured below) and time trial events to show case your talents. Our certified coaches can also build you a customized cycling or triathlon training program around your busy schedule that incorporates Elite Cycling with additional power and heart rate based workouts to ensure you meet your goals. Call today for a consultation and evaluation appointment. Who says there's no such thing as a free ride? 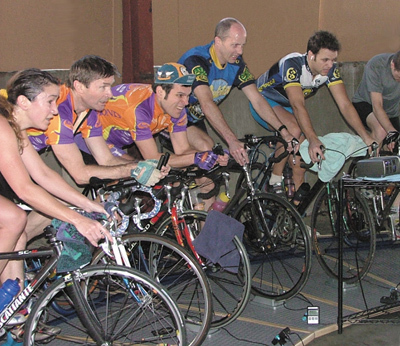 Come to the open house on Sunday, June 14, 4:00 - 7:00 p.m. for a free ride on our CompuTrainer Multi-Rider system. Rides start at 4:00, 5:00 and 6:00 p.m. Space is limited to the first eight riders at each start time. Bring your road bike and shoes, and friends, too.